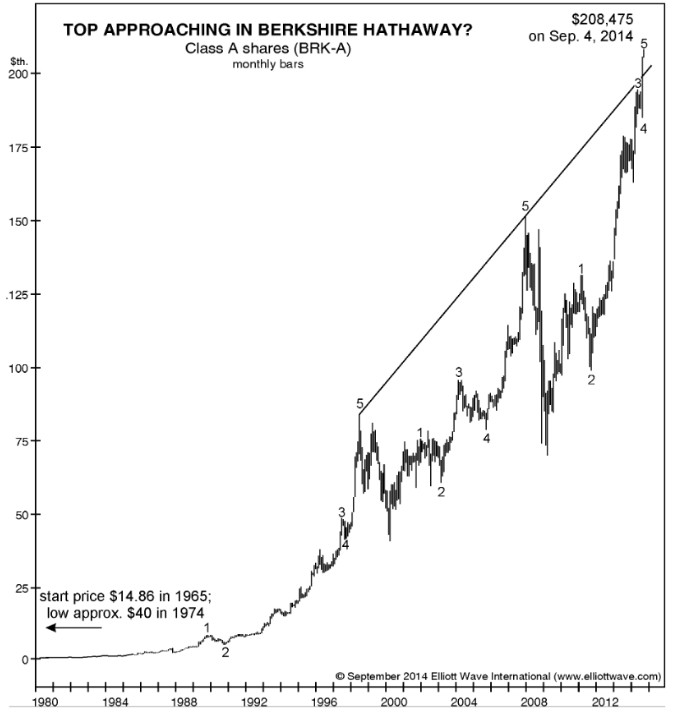 Top Approaching in Berkshire Hathaway? Editor's note: The following article originally appeared in a special September-October double issue of Robert Prechter's Elliott Wave Theorist, one of the longest-running financial letters in the business. From Sept. 25 to Oct. 1, Prechter's firm, Elliott Wave International, is throwing open the doors to all of its investor services 100% free. Click here to join EWI's free Investor Open House now. It piques our interest when a person or company makes the front page of a magazine or newspaper. On August 15, USA Today ran an article with a chart on the share-price performance of Warren Buffett's company, Berkshire Hathaway. The Guardian and other papers covered the news, too, which was that the stock had cleared $200,000/share. The stock (symbol BRK-A) has returned a 19.7% compounded annual return to shareholders since 1965, the year Buffett turned a failing textile company into an investment company. It has returned 22.8% annualized since 1977. Let's just say that the stock has produced about 20% per year compounded. The above figure shows that the stock has just met a 16-year resistance line on arithmetic scale. The next figure shows that it is still a bit shy of that line on log scale. As you can discern from the second figure, the stock enjoyed a persistently steep rise until early 1998. In 1996, the stock was getting a little expensive for the average investor at $30,000/share, so Buffett created a "Class B" stock, a smaller share selling at a fraction of the price of the "Class A" stock. It began trading in May of that year. So, the public was given this opportunity two years before the steep rise ended on June 1, 1998. Since then the stock has still been beating the market but at a slower pace. To put the difference in perspective, the stock rose 2100 times from the 1974 low of 40 to the 1998 high of 84,000 and only 2.5 times from there to now, which is 1/840th of the multiple in two-thirds the time. Loosely stated, the latter rate of rise is 1/560th of the former. Buffett's return is amazing, but what makes it more amazing is that he started his investment empire the very year the U.S. domestically went off hard money and one year before the Dow made a major top in terms of real money (gold), which it is well below today. The era of rubber finance has goosed investment compounding, and Buffett's style was made for it. We could be wrong, but we think the era of inflationary finance is ending. Its time is due, the price is right, and the Fed is so far out on a limb with leverage that QE-infinity seems unlikely. It will be interesting to see how BRK-A does when the monetary environment fundamentally changes from expansionary to contractionary. Even if it continues to outperform most other funds in the bear market, it is still likely to succumb to its biggest setback ever. Showing (in our opinion) continued acumen, Berkshire Hathaway "currently has $50-billion-plus in free cash, the biggest cash hoard ever." Naturally, "(Buffett) is still bullish and still looking [for buys]." (USA Today, 8/15/14) Things could hardly seem better. But often that's a good time to sell. To continue reading Prechter's 18-page special September-October double issue of The Elliott Wave Theorist, click here to join EWI's free Investors Open House now. 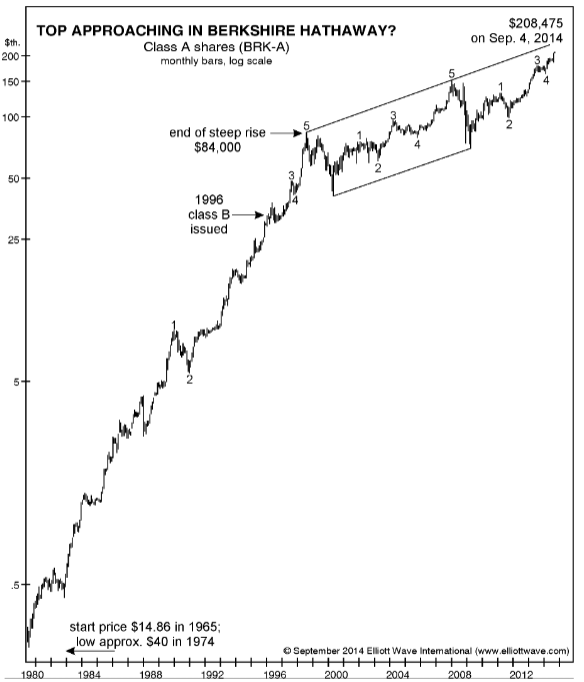 This article was syndicated by Elliott Wave International and was originally published under the headline Inside Look: Top Approaching in Berkshire Hathaway (BRK-A)?. EWI is the world's largest market forecasting firm. Its staff of full-time analysts led by Chartered Market Technician Robert Prechter provides 24-hour-a-day market analysis to institutional and private investors around the world.